- Users who currently see notifications in their Google Drive Android app (for instance, when someone mentions them in a comment or shares a document with them) will now see notifications in their Docs, Sheets, and Slides Android apps as well. These notifications are specific to the app they’re working in and only appear if the user has an updated version of Google Drive installed on their mobile device. 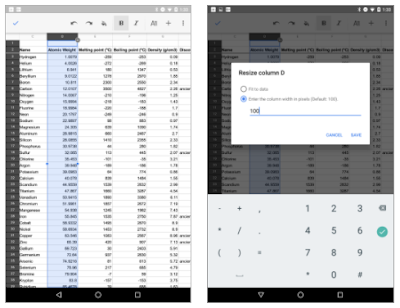 Resize rows and columns in Sheets - Users will find it easier to resize rows and columns in the Sheets Android app, which now features options to specify the pixel sizes of rows and columns and to fit columns to their data exactly. 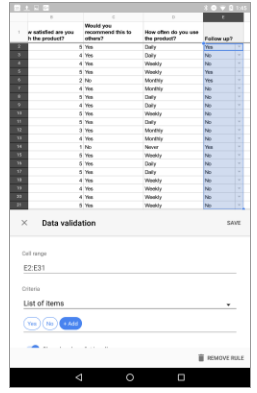 Create and edit data validation in Sheets - Just like they can on the web, users can now create and edit data validation criteria in the Sheets Android app. Change the color of sheet tabs in Sheets - Users can now differentiate between sheets in a spreadsheet by changing the color of their tabs in the Sheets Android app. Visit the Google Play Store to download the latest versions of the Google Docs, Sheets, and Slides apps for Android. Notifications in Docs, Sheets, and Slides - Users who currently see notifications in their Google Drive Android app (for instance, when someone mentions them in a comment or shares a document with them) will now see notifications in their Docs, Sheets, and Slides Android apps as well. These notifications are specific to the app they’re working in and only appear if the user has an updated version of Google Drive installed on their mobile device.